Ashley and I have been celebrating Frugal February ever since the phrase was coined by Amy and Kieron over at Don’t Ever Look Back. Like Amy and Kieron, we have been in ultra budget mode trying to scrimp and save every bit for our upcoming around the world trip. After our car related financial setback in January, the timing couldn’t be better. Naturally, to prepare ourselves for our very tight Frugal February budget, we ordered lunch at our favourite restaurant, the Gateway Cafe, located in downtown Qu’Appelle. And naturally, we splurged. We had delicious egg rolls, chicken balls, fried rice, ginger beef, and long dry ribs. It was glorious. That is of course, until the bill and fortune cookies arrived. I think next time I’ll order my fortune cookie as an appetizer. If I would have gotten this advice at the start of my meal, we probably could have gotten away with splitting a burger. Of course “next time” will have to wait until Frugal March. There’s always room for a little slip-up during Frugal Feb – now that you’ve made it, time to grind out these last two weeks and really save the pennies. Here’s to Meager March. 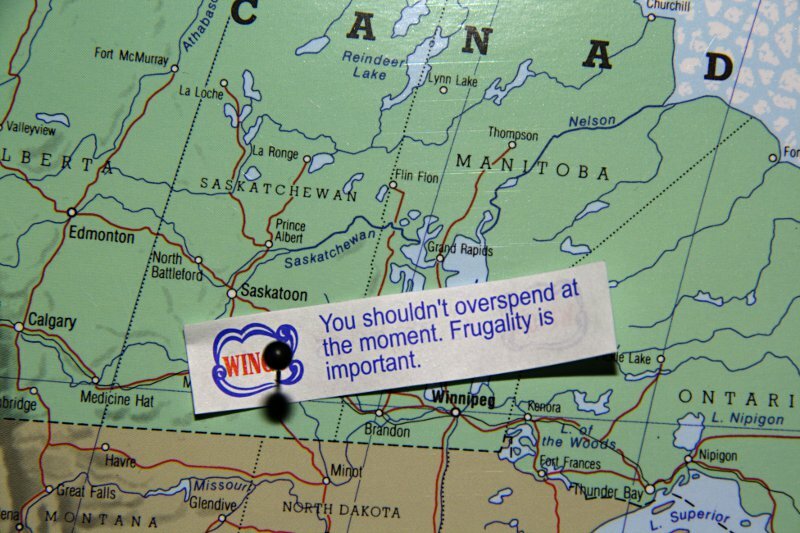 Thanks again for putting together Frugal February. It’s certainly helped to keep us on budget. Well that, and the fortune cookie of course.